Here is some two plied textured yarn I made from a “Jacobs” fleece. Jacob’s fleece has patches of white, gray, brown, and black in it. The “namers of sheep” must have named it that after Jacob in the Bible who had all the spotted goats. After working for his father in law for 21 years to earn his wives Leah and Rachel and part of the flock, he was allowed to take away all the spotted goats when he left his father-in-law’s estate and traveled home where he came from. 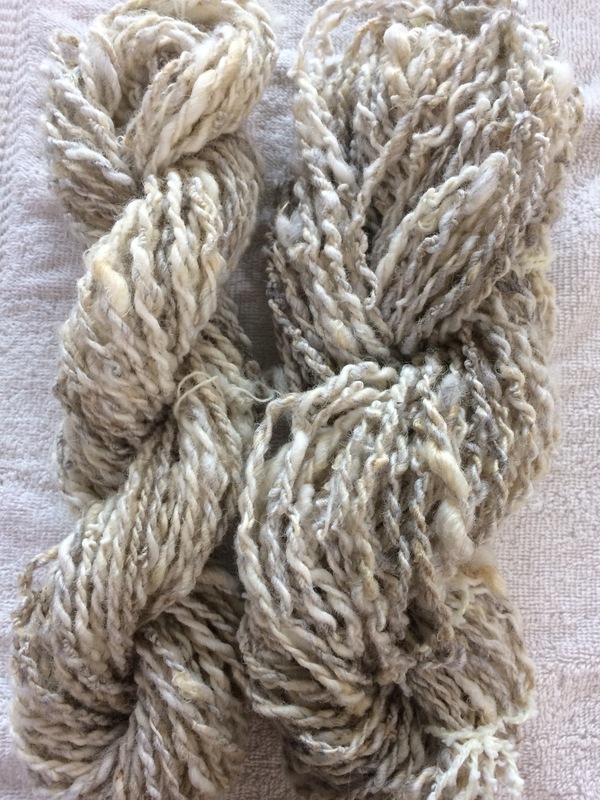 I spun directly from the locks without carding or combing them to see what kind of texture of the yarn would have. I love it. I love the oatmeal color of it. This yarn was spun from the whites mostly but including slight hints of gray as well. I have been watching a Russian fashion designer who uses texted yarn in her felting of gorgeous dresses. I intend to try it myself. I will post a link to her video soon. Thanks Linda! I really enjoy spinning yarn, it is so meditative. Previous Previous post: Fleeces are Fun! Next Next post: Video From My Favorite Felted Clothing Designer, Diana Nagorna, and Her AMAZING Creations! !